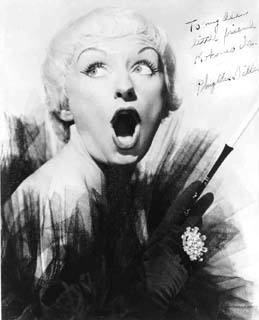 Phyllis Diller wanted to be a concert pianist, and studied at Chicago's Sherwood Music Conservatory. But fate intervened: she fell in love, got married, raised a family, and in 1955 she was a frumpy 37-year-old housewife who wanted to do stand-up comedy. She worked as a newspaper columnist and a publicist -- an odd combination of careers that may have given her an edge when she tried out at San Francisco's famous Purple Onion night club. They gave her a two-week gig, and when her ghastly laugh and self-deprecating humor made her a hit, her act was held over for almost two years. Diller cut her first comedy album in 1959, then made her motion picture debut in a small role as a nightclub star in the Warren Beatty-Natalie Wood romantic melodrama Splendor in the Grass. In 1963, she guested on What's My Line?, and after that she showed up on several of Bob Hope's TV specials and three of Hope's movies, most memorably as his maid in Boy, Did I Get a Wrong Number (1966). She played a bankrupted millionaire in the late-'60s sit-com, The Pruitts of Southampton. Diller had a pacemaker installed in 1999. She has announced her retirement at least three times, and in 2002 she again announced she had done her last stand-up gig. She had a recurring role on The Bold and the Beautiful through 2004. She did not like dirty jokes, and did not appreciate the urban legend that she was Susan Lucci's mother (there is no relation). She died in 2012. Originally raised a Methodist. But see Minneapolis-St. Paul Star Tribune, 1 January 1999: "We were not created by a deity. We created the deity on our image." Quoted later, in the November 2001 issue of A&U magazine: "Religion is such a medieval idea. Don't get me started. I have thought about every facet of religion and I can't buy any of it."